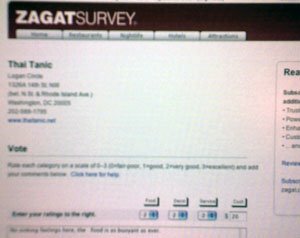 Brunch Bird: I "Almost Peed Myself" Seeing Zagat Had "Served Up" My "Heapin' Helpings" of "Hilarity"
I "Almost Peed Myself" Seeing Zagat Had "Served Up" My "Heapin' Helpings" of "Hilarity"
I detest the Zagat restaurant guides. What modicum of information they offer about a restaurant is obscured by the sheer inanity of their style. Every time I peruse one I can only see the Saturday Night Live "Zagat" skit with Chris Farley in drag reading one to Adam Sandler as they try to find a restaurant for their anniversary. So imagine my delight to get an email some months back asking me to participate in the survey that would eventually become the 2007 D.C./Baltimore guide. I decided that this would be good practice for my freelance writing adaptation skills. My mission: see if I could pen phrases so asinine, yet Zagat-worthy, that the Johannes Gutenbergs behind this burgandy Bible would simply have to include them. To be fair, I wouldn't lie about my general feelings for a restaurant. If it was good, I'd make a comment accordingly. Ditto if I hated a place. Guess what came in the mail yesterday?! Thanks to Zagat's online survey registration which saves comments, I was able to compare the new guide with the comments I submitted for 25 D.C. restaurants lo those many months ago. Total score: three hits! Thai Tanic: "No sinking feelings here, the food is as buoyant as ever!" It's that easy. Someone "stop them!" "Please!" aww everyone loves a good pun! my fave places are 1789, Zaytinya, and Zengo. I've got restaurant week reservations for Zengo and I'm so excited because I've never eaten there. I lurve 1789.